It seemed like just a while ago that I was reviewing this young Finnish vocalist’s debut CD ‘Fuel for the fire’; and now just 13 months after his first release, Ari Koivunen has brought out his 2nd CD, entitled ‘Becoming’. For those who don’t know who Ari Koivunen is, he won Finland’s version of “Idol” in 2007. ‘Fuel for the fire’ was very successful in Finland, and is one of the fastest selling records in Finnish music history, with over 10,000 copies sold in the first week of sales. ‘Fuel for the fire’ remained the number one CD in Finland for 12 weeks after its release. The CD reached double-platinum status (60,000 units) in October 2007. With ‘Fuel for the fire’, Ari’s band was made up of musicians from bands such as Koltipelto, Thunderstone, Tunnel Vision and Warmen. This time round, Ari Koivunen has a whole new group of musicians ranging from bands such as Craydawn, Urban Tale and Amoral. In all, Ari Koivunen has 6 members of the band, however one of the musicians has since left (Luca Gargano). Once again, the Ari Koivunen band has delivered some great European melodic metal. Much like with Ari’s original backing musicians on his debut release, this new group also does a great job. The musicians, coming from basically local Finnish metal bands, have really put their names out there with this release. The music flows smoothly on ‘Becoming’, where Ari has gone for a more slower sound than his debut. The guitars are more darker and chunkier, with a lot more emphasis on bass; and only about half the CD has mid to fast-paced songs. You can feel Ari Koivunen’s natural progression, vocally, on ‘Becoming’. His vocals are naturally high-pitched and you get the sense that his delivery has improved, but there are still areas to work on. His range is much better; while the emotion in his voice still needs a bit of tweaking. I feel that the emotion through the music doesn’t always match the emotion of Ari’s vocals, but that really doesn’t happen all that often. Still, this young man has plenty of talent and it shows with the amount of success his 2 CD’s have already had. Onto the songs on ‘Becoming’ and there quite a lot of gems on here, much like it was the case with his debut CD. All 11 tracks, possibly bar one are all very good. They all are consistent with one another and the different music styles gives this release a stronger feel than the debut. As far as the better tracks go, I can’t go past “Tears keep falling” as the best track on the CD. Every time I hear it, it feels as though it was made for a recent Edguy CD, a la ‘Rocket ride’; and Ari also sounds very much like Tobias Sammet throughout this track. It has a great driving chunky riff and heavy bass and sounds kinda similar to “King of fools”. The 2nd best track would be “Keepers of the night” which is a catchy mid-paced track, showing off Ari’s delightful vocals. Another chunky riff drives this track followed by a memorable chorus. Other songs which have ultimately bumped up the rating I have given for this CD would be “Raging machine” (grinding track with great riffs and creative keyboards), “Under the burning sky” (another slow, galloping riff-driven track with an awesome vocal delivery); and “My mistake” (purely vocal driven, emotional, with great melodies). 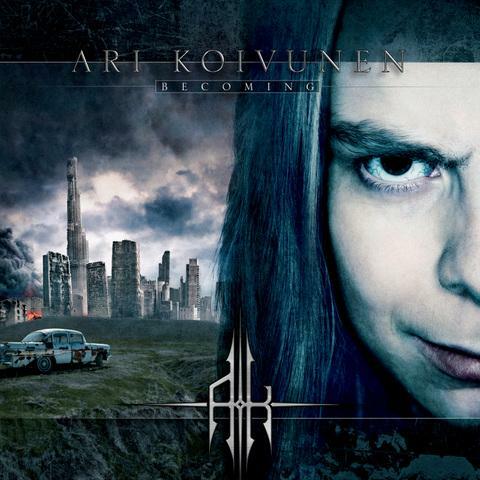 Overall, this is another success for Ari Koivunen, whose CD sales for ‘Becoming’ are already looking just as good, if not better than ‘Fuel for the fire’. This vocalist has the world at his feet, particularly in Europe, and could climb as high as he could possibly go. With 2 successful CDs under his belt, Koivunen has the option to remain as a make-shift band headliner, or delve into another structured band, becoming their vocalist. I think the safer option would be to release his own 3rd solo CD and then think about taking up offers from other bands. But for now, Ari Koivunen is enjoying his success, and why not, as ‘Becoming’ is a damn fine CD and one to certainly watch out for.